Yes, it's true. The city of absurdly tall buildings, infinite heat and Premier League footballers also boasts a surf break. If you don't believe me, check out this footage, courtesy of Current.com. Tim Winton's Breath has been attracting oodles of media attention, so much so that, out of sheer pique and infantile jealousy, I'm tempted not to read it. I jest. The universally good reviews suggest that Breath might even eclipse Kem Nunn's The Dogs of Winter; certainly, for anyone interested in surfing's interaction with literature, it is a must-read book. By far the most interesting review I've read, to date, appeared in the Times Literary Supplement for 16 May 2008. It's by Dr Ronan McDonald, the Director of the Beckett International Foundation and Senior Lecturer at the University of Reading. It was originally published under the headline "Grace and surrender", with the strapline "Surfing and the fascist aesthetic". It's reproduced here by kind permission of Dr McDonald and the TLS. Like Hardy's Wessex or Faulkner's Mississippi, the Western Australian landscape has been consecrated by Tim Winton's fiction. He has been garlanded with literary awards and acclaim in his native Australia, and has been twice short-listed for the Booker Prize in the UK. His work is preoccupied with wounded or troubled characters, often haunted by their past, who set out on actual or psychological journeys in search of purpose, meaning and redemption. Dirt Music (2002) depicts a vast, hostile outback in which the individual self is tiny and threatened. In Breath the sea takes on a comparable role, an immense elemental force that simultaneously compels and controls the protagonists. The story is told by Bruce Pike, a middle-aged paramedic, recollecting the adventures of his adolescence. The action takes place in and around Sawyer, a small mill-town near the mouth of a river. For '"Pikelet"' and his friend Ivan Loon ("Loonie"), the sea promises exhilaration, risk, excitement, an alluring alternative to the staid routines of their parents' lives. When they fall in with a mentor, '"Sando", a surfing maestro in his thirties, a triangle of male yearning, rivalry and betrayal develops. 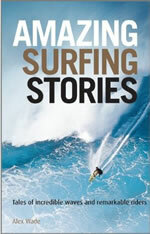 This novel is a paean to surfing. But it will not only be savoured by those of sun-bleached hair and rippling torsos. It treats elemental themes of fear and friendship, loneliness and boredom, the lure and danger of life lived intensely, the broken promises of adolescence sliding into middle age. Sando and his wife, Eva, are labelled as hippies. Yet there is nothing peace-loving or egalitarian about their self-destructive cravings. This is not so much a community as a hierarchy of signal individuals: an elite. Pikelet is something of a loner and, we learn early on, avoids "teamsports of any kind". Sando has an insouciant "princely manner", and is compared to a Brahmin and a matador. He and his two apprentices are, for Sando, "discreet gentlemen" seeking out "appointments with the undisclosed". Good to see Stef Harkon down at PK today. He's back from the O'Neill Mission, which certainly sounds like a mission given the 2,500 miles driven in search of surf (now that's a surf trip, and all in one country). Stef said that a good skate session went down, and then I recalled that Dave Flanagan had sent me this link. Check it out - some nice, inspirational carving, even if memories of stacking it in Strathy still loom large. Surfers Against Sewage (SAS) campaigners have finished another year's Grassroots Tour. Here's Campaigns Director Richard Hardy on what went down. Each year SAS plans a weeklong tour to visit key watersport sites up and down the country. Over the last few years we’ve been the length and breadth of the country and met some great people who are passionate about protecting and improving their coastal environment for all to enjoy. This year’s tour was no different, with keen audiences checking out the latest SAS campaigns and watching our very own eco-surf documentary – View From The Greenroom. This year’s tour took a west coast route, with stops in North Devon, South and North Wales, the gateway to Scotland’s West Coast, Glasgow, and the hub of Northern Ireland surfing – Portrush. With our watery playgrounds under threat, those attending the talks were able to find out from SAS campaigners how issues like climate change and marine litter are choking our blue planet. We also spoke about the key pollution issues of tomorrow and supporters got the inside track on how to campaign effectively in their own back yards with lessons in behind the scenes creative campaigning that SAS use in achieving victories for the environment. It was great to get out around our beautiful coastline to share what’s good (and what’s not) about using the UK’s beaches for recreation. We hope we’ve helped inspire a new batch of eco-surf warriors to help protect and preserve their breaks from damage in the future. This year’s tour was supported by Patagonia Footwear. Thanks to them we were able to raffle off a pair of Patagonia Shoes and organic cotton shopping bags each night. Those entering the raffle during the tour stops will also go into a draw at the end of May, where they could yet win a brand new Eco-board. Duncan Holme from Patagonia Footwear added: "Patagonia Footwear was proud to supporting Surfers Against Sewage on their Grassroots Tour and for helping us all to think about our environmental footprint." British female solo sailor Sam Davies, sponsored by Roxy, during the night crossed the finish line of The Artemis Transat just off Boston, USA. She completed the single-handed race aboard 60 foot racing yacht Roxy in 15 days and 10 hours. In finishing The Artemis Transat, Sam Davies has just completed her 15th transatlantic race and the sixth onboard her pink boat since being appointed skipper at the end of 2006. It's a dog's life - but will Bilbo be back? I posted recently about Bilbo. I'd like to see him back on the beach, and if you agree, add some comments to this typically trenchant piece by Alf Alderson. As a dog owner it saddens me that a fine and honourable hound like Bilbo should be barred from his calling. It saddens me still further that an august body like the RNLI should have made this decision, for now one of the most popular charities in Britain is being made to look rather ridiculous by its actions. But it’s not just the RNLI which has a thing about dogs. As anyone who lives close to a Blue Flag beach will know, once that flag is raised above said beach man’s best friend is banned from setting paw upon sand until the tourist season is over (good on Penwith District Council for allowing dogs on the beach morning and evening – here in Pembrokeshire you and your dog will be shot by snipers hiding in the dunes if you venture anywhere near the beach between May and October). I crossed the county line today, making a trip to my hometown, Exmouth, to see my sister who's just had a baby. En route the family and I stopped just outside Topsham and met up with Kyle Dent, the inventor of brushboarding. Also there were Ben, Keith and Steve, more of the brushboarding crew, who showed us how this fine new pursuit is done and then kindly let us have a few goes on the electrically powered brush ramp. The consensus from all three Wades who went brushboarding is that it's a blast. It's hard work on your legs and will get your heart pumping, but brushboarding is a slice of pure fun. After half an hour or so we were all thoroughly stoked (not least, on a personal level, because brushboarding has come out of Exmouth), and we'll be heading up the A30 again on Thursday when brushboarding comes to Crealy Adventure Park in Wadebridge. We're hoping to be joined by a few of the Sennen area rippers and Mike Newman will be on hand to take some shots for a forthcoming Pit Pilot piece. Try and get there if you can - it may look surreal, but brushboarding is superb. Harry and I even made it back to the Cove for a few waves just before high tide. The surf was small but the sun was shining, and the water is starting to warm up nicely. Look out for the basking sharks - there was one at my local break two days ago. To talk in the line-up, or not? Recently ADR of The Surfer's Path penned an editorial in favour of silence, not least because of what seems to have been fortunately just a temporary affliction of surfer's ear. I met a local surfer a couple of days ago who said that she, too, preferred total silence, but for different reasons - she liked the time and space to think, and as a beginner, didn't want to be distracted. In contrast, three or four male surfers at Gwenver recently seemed to believe that they were there not merely to surf but to see who could shout the loudest. Myself, I like a bit of chat, but not too much. I had just the right level yesterday during a surf that ranged from very bad, to OK-to-good, and back to fairly rubbish again. I always enjoy a bit of banter with Allie (who points out, in response to my recent posts about surfing in one's 40s, that round here just three words are needed: 'Pete the Yank', 73 and still going strong) and needless to say, given that I do all my surfing with my elder son Harry, he and I chat throughout a session. But yesterday I also found myself chatting to local surfer PT, who conveyed some news which was a delight to hear. After a period of dormancy, what I'm told is the UK's oldest surf club is set to reform. The Sennen Surf Club's revival owes much to local characters such as PT, Mick Jackson and Jamo (he of Bilbo fame). I'm not sure if the club has officially been relaunched yet, but the plan is to create a club that merges surfing, surf-lifesaving and general fitness training for surfers in and around Sennen Cove. The area has produced some outstanding surfers - the likes of Sam Smart, Sam Bleakley, James Parry and Jon Buchorski spring to mind - and having a year-round club to serve as a focal point for surfers of all abilities will hopefully help bring on the next generation. I think I'm right in saying that the Sennen Surf Cadets kick off again next Saturday. Dave Muir has done a great job with them and I know that my sons can't wait for the return of Saturday morning surf sessions. With the Cadets to run over the summer and Sennen's surfing club about to be reincarnated, things are looking good in the far west. Meanwhile, I hear, although not from the line-up, that the O'Neill Mission has scored some waves over in La Torche, France. This is a wild and windswept spot, or was 23 years ago when I windsurfed it in a force six with head high waves (no injuries but a near drowning and broken mast for Rich and Elliot, out there with me back then). Those were the days. The funny thing is that mentally I still believe I'm capable of the athleticism I had back then, but increasingly the evidence suggests otherwise. At 42 (and eight weeks), no doubt I'll struggle on, ruing the surfing law that says if I'm having a bad surf it'll always be in front of everyone I know (while the good ones go unwitnessed), but never mind: a little bit of chat in the line-up is no bad thing, and I was stoked by what I heard yesterday. After all the hullabaloo (great word - must be used on a daily basis), they're off. Pictured here is the British team about to depart for the 2008 Quiksilver ISA World Junior Surfing Championships, which take place in south west France from the 24 May to 1 June. The team is comprised of, in the Under 18s, Lyndon Wake, Lewis Clinton, Arron Evans and Stuart Campbell, while in the U16s are Luis Eyre, Josh Piper, George Picking and Toby Donachie. In the Girls' team the new 16-year-old champion Holly Donnelly is joined by Karma Worthington, Kathleen Spears and Tassy Swallow. A lot has been said about this but all I'm going to say now is: good luck.